We love our vans and never tire of saying so. The iconic yellow means that they are easy to spot when we are hard at work around town. But the vans are more than just a bright and cheerful reminder that someone is getting their carpets, upholstered furniture, air ducts or tile and grout cleaned! They are the command center for our operations. The vans are how we are able to deliver our services and leave no trace behind. 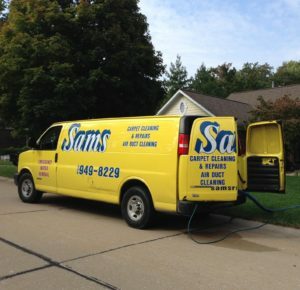 Each of our vans is powered with the cleaning equipment and technology your job needs! When we pull up to your home, we are fully equipped to conquer the task at hand without using any of your resources. This means that all of the water both for the job and waste are supplied and then extracted directly into the van. And our high-powered suction, generated directly from the van, just can’t be beat. It’s a closed circuit from start to finish. Plus, our processes and equipment meet the cleaning standards required by major carpet manufacturers such as Mohawk and Shaw who call for professional cleaning to maintain the carpet’s warranty. All Sams vans contain GPS units so that when an emergency occurs we are able to quickly locate a van and get it to a job site as soon as possible. With our large fleet of trucks and vans, you can rest assured that help from Sams is only just a short drive away. The technology onboard our vans allows us to travel to your residence and get the cleanup process started to minimize any damage that occurs when the unexpected happens. If you can’t tell, our fleet of yellow vans is our pride and joy! Once you have seen them in action we think you’ll agree. Call us night or day to help you get your house spotless!